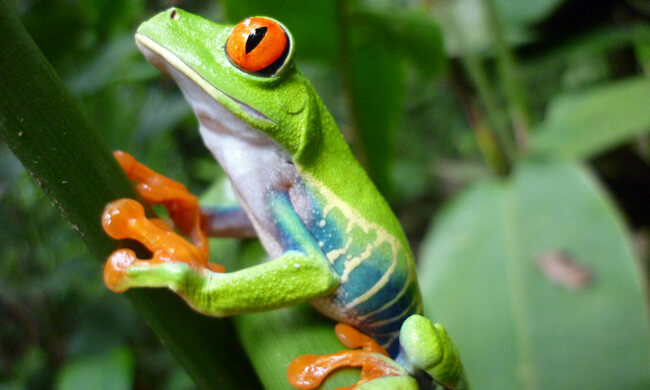 Learn about Sustainable Eco Programs & See Amazing Wildlife of the Tropics. EcoCentro Danaus is a biological reserve located just few miles outside of La Fortuna, near Arenal Volcano. This center works with conservation programs, providing training on environmental education and sustainable use of the land. This guided tour takes you on a trail through the secondary forest where you can see a wide variety of plant and animal life in a relatively small area. As you walk the trails of the Danaus Nature Reserve through the secondary rainforest, you will have the opportunity to see wildlife such as sloths, iguanas, poison dart frogs, caymans, and emerald basilisk lizards, as well as many tropical bird species. You’ll also see a stunning variety of rainforest plant species as well as a medicinal plant garden. Finally, you’ll visit the eco-center’s butterfly garden with its display of larvae, pupae, and eggs and some of Costa Rica’s most beautiful butterflies such as the blue morpho, owl butterfly, monarch, and swallowtail. This is a great tour for families, seniors, and people interested in learning about wildlife and plants. Although this tour is not physically taxing, it is on a gravel trail which could be difficult for anyone in a wheelchair or with difficulty walking on uneven surfaces. Tour includes: transportation, naturalist guide, water. It is available early in the morning or at dusk. What to bring: camera, insect repellent, comfortable walking shoes. Duration: tour time (approximately 1.5 hours) + transportation time (20-30 minutes each way).